At the entrance to the island of Key West, the unique Key West Golf Club's 18 holes encompass over 200 acres of beautiful Florida Keys foliage and wildlife. Stately palms ... dense mangroves... serene lakes... rolling fairways and dramatic greens... egrets in the distance... clean, clear tradewinds... Golf legend REES JONES masterfully designed this public, 18 hole, 6,500 yard course to be a challenge to players of all abilities. 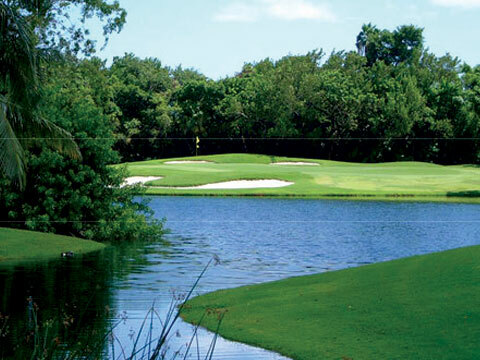 Come meet all the exciting challenges of the course, including the infamous "Mangrove Hole" (143 yards, par 3 that is played completely over a field of thickly intertwined tropical mangroves). Key West Golf Course, Fairway There's no other course like it... At the "Gateway to the Caribbean," we invite you to come and experience the exhilaration of playing a round at our beautiful tropical course. Our pro-shop carries a full line of top quality golf clubs and accessories at low low prices, as well as Key West Golf Club souvenir hats, shirts, balls and more. They make great gifts and will surely be noticed. We can arrange shipping of your purchases or simply have them delivered to your hotel. The pro-shop takes major credit cards & travelers checks as well as cash.